If you are a student of parent of school going kids, you will be aware of co-curricular activities at schools. In simple words, co-curricular activities are learning programs that support the curriculum of a class. They make learning easy and fun by using creative teaching methods. Some co-curricular activities are also held for imparting certain life skills to students. They help a child develop physically and mentally, acquire social skills and attain some degree of independence in doing day-to-day chores. 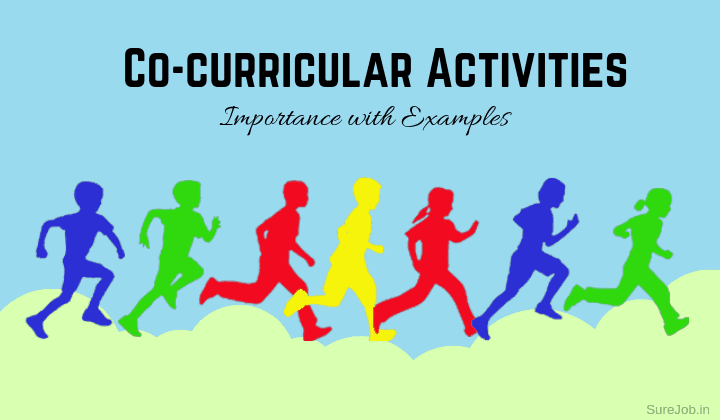 I am listing some common co-curricular activities that are found at schools to help you better understand their importance in education. However, the availability at your school can depend on its location and type of curriculum. Fun activities for kids are held as part of the learning process. Here are some common fun activities for kids. 1- Celebrating festivals at schools: It helps to foster a sense of fraternity by involving students of all faiths and followings. 2- Fancy dress competition: Helps to create dignity of labor about people of various professions and trades. 3- Decorating a classroom wall: Brings out creativity among students and promotes team spirit. In my days, two or three schools combined resources to hold common summer activities for students. 4- Summer Camps: They are held on a school campus and include sports activities. Usually several teams of students will be formed to play sports like cricket and football, badminton and hockey. They help develop team spirit and healthy competition. 5- Arts Club: As a member of arts club of my school, teachers encouraged me to draw and paint pictures on various themes. It helps develop creativity and give expression to emotions. Craft activities help students to give expressions to their creativity. Nowadays it also teaches students how to recycle things such as paper, cardboard, plastic, Styrofoam and other material. 6- Craft Classes: Most schools will include a craft class on its weekly timetable. Children have to create various articles using colored paper, cardboard and other material. 7- Album Making: In some countries, this is also called scrapbooking. This co-curricular activity includes making an album on one or two topics of interest to a student from the regular curriculum. For example, you can make an album of newspaper clippings and pictures about geography or history, news and current affairs. This was my favorite type of co-curricular activity since I could do it with little or no help from teachers and parents. 8- Experiments: Doing simple experiments at home can include growing a plant from a common food grain, building a kaleidoscope or periscope with broken glass bits and mirrors and several other similar things. 9- Home Projects: You can be asked to work alone or jointly with other students of your class who live near your home. 10- Helping Neighbors: This co-curricular activity is practiced in some schools. Students will help neighbors to perform simple chores like shopping for groceries, cleaning their house or vehicle for a small fee. The amount collected goes to the school to support students from economically weaker families. Every school conducts group activities for kids as part of co-curricular education. These activities are usually in the form of competitions. 11- Quiz Contests: You can become part of a group in the class and participate in quiz contests. It helps develop general knowledge. 12- Drawing Competitions: Drawing competitions are held as group activities for kids of all ages. Here you can give expression to your creativity. 13- Crafts Contest: Using simple stuff like colored paper, cardboard and glue, you can create something useful and win a prize. 14- Decorating Classroom Wall: This co-curricular activity usually involves pasting pictures, short articles and interesting material related to your subjects on the classroom wall. Every student pastes something in which they have interest and is related to the curriculum. Art activities for kids are excellent since they bring out the cultural diversity and helps develop fine arts and performing arts. 15- Dancing classes: Here you can learn dances from various Indian states. 16- Singing solo and group: Become a part of the school’s music club and develop singing skills. You will also be called to sing on occasions like Republic Day, Independence Day, Parent’s Day and Annual Day celebrations. 17- Drama & Acting club: Schools include drama and acting club or invite students to participate in plays to showcase talents during various celebrations or to create awareness among public. Picture activities should not be confused with regular drawing and painting classes conducted at schools. Instead, they are more advanced as they focus on teaching more skills to students inclined towards such arts. 18- Photography club: Lots of schools have photography clubs where you can participate. You will need a basic camera and shoot pictures for display on the campus. You might also have to participate in group projects. 19-Drawing and Painting Excursions: This means you and other students will be taken to a scenic place. You have to make drawings and paintings of various elements at these spots. As the term explains, science activities aim at improving knowledge in various fields. These activities are very useful for higher education such as medical and engineering streams. 20- Science clubs: Students and science clubs are assigned individual and group projects and experiments. Depending upon your interest, you can join a physics, chemistry or biology club. 21-Math clubs: Another very important subject is mathematics. Here you will learn more skills related to the math subject in your curriculum. There are few more co-curricular activities for kids that are organized by most schools. Joining them will also boost your knowledge. 22- Environmental studies: Here you will learn a lot about the environment, environmental threats and pollution, awareness and recycling material. 23- Student’s Banking: Nowadays, most banks in India offer special accounts for school students. This is done in collaboration with schools. The objective is to encourage you to save money and learn how to manage finances. 24- Sports: Though all schools have annual sports events, some also offer sports clubs. Here you can practice and perfect your skills in a favorite sport. 25- Story and Essay Writing: Other than writing stories and essays as part of the main curriculum, schools also hold competitions. You can write essays and stories on own topics to compete. In my humble opinion, co-curricular activities are equally important for every student. Here are some reasons why co-curricular activities are important. They provide a fun way of learning to students. Students find it easier to remember skills learned from co-curricular activities. Parents, teachers and students can identify their innate skills through co-curricular activities and fine-tune them to make a career. Co-curricular activities develop a sense of team play and camaraderie. Certificates from participating in co-curricular activities are useful when seeking admission for higher education and later, in job hunts. Students that participate in co-curricular activities develop higher levels of confidence. During vacations, students remain gainfully engaged with co-curricular activities. In a multi-ethnic country like India, co-curricular activities fosters better understanding of different cultures and creates a sense of unity. Generally, participating in co-curricular activities organized by schools is free of cost for students. In some cases however, a student may have to bear expenses related to buying material, equipment or traveling. Schools usually subsidize the expense of extra co-curricular activities. Therefore, you can select a co-curricular activity that suits your passion and budget. Participating in them will help you lifelong.